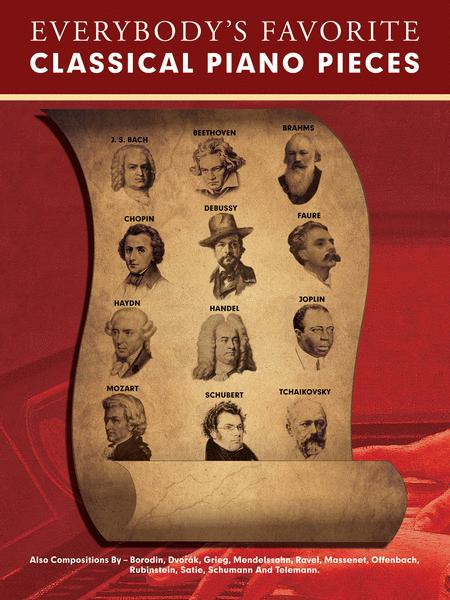 47 compositions by Bach, Chopin, Debussy, Haydn, Joplin, Mozart, Schubert and many others. 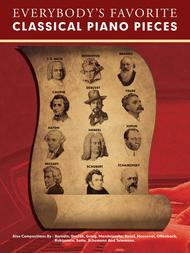 Includes bios and images of each composer. Contents: BACH: Air on the G String • Jesu, Joy of Man's Desiring • Toccata and Fugue in D minor • BEETHOVEN: Bagatelle in G minor, Op. 119 • Sonata Pathetique, 2nd mvt. • Symphony No. 7, Allegretto theme • BORODIN: String Quartet No. 2, Nocturne • BRAHMS: Capriccio in G minor, Op. 116, No. 3 • Lullaby Op. 49, No. 4 • CHOPIN: Fantasie-Impromptu, Largo section • Military Polonaise • Raindrop Prelude • Prelude, Op. 28, No. 4 • DEBUSSY: Clair de Lune • Golliwogg's Cakewalk • DVORAK: Humoresque • FAURE: Apres un Reve, Op. 7, No. 1 • Pavane, Op. 50 • GRIEG: Piano Concerto in A minor, Opening • HANDEL: Queen of Sheba • The Harmonious Blacksmith, Air and Variations • Zadok the Priest, Coronation anthem • HAYDN: Serenade from String Quartet, Op. 3, No. 5 • JOPLIN: The Entertainer • Maple Leaf Rag • LISZT: Consolation No. 3 • MASSENET: Thais, Meditation • MENDELSSOHN: O for the Wings of a Dove • Sweet Remembrance, No. 1 • MOZART: Piano Concerto No. 21, 2nd mvt. • Sonata Facile, K. 545 • OFFENBACH: The Can-Can • RAVEL: Pavane pour une Infante Defunte • Piano Concerto in G, 1st mvt. • RUBINSTEIN: Piano Concerto No. 4, 2nd mvt. • SATIE: Gnossienne No. 1 • Gymnopedie No. 1 • SCHUBERT: Ave Maria • Impromptu No. 3, Op. 142 excerpt • The Trout Quintet, Op. 114, 4th mvt. • SCHUMANN: Chiarina from Carnaval, Op. 9 • The Wild Horseman • TCHAIKOVSKY: June: Barcarolle, No. 6 • Piano Concerto No. 1, opening • Sentimental Waltz • TELEMANN: Fantasia in B minor.